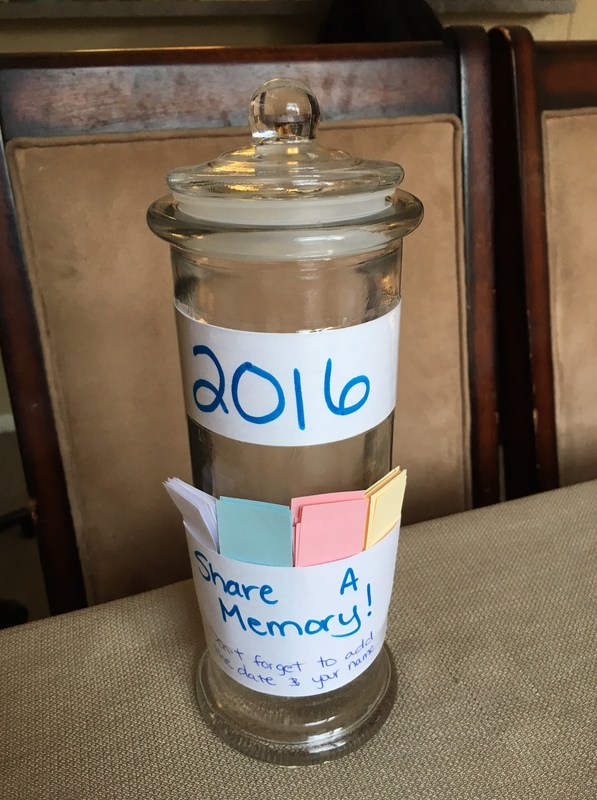 A couple years ago I got this idea (not sure from where) to make a memory jar with funny and memorable moments throughout the year. The memory’s that were added would then be read on New Years Eve for a time to reflect and remember the little moments that were a part of your life that year. We have continued this tradition going into 2106 and I wanted to share this with you and your family. Jar to hold the memories – I went to the thrift store and bought this glass straw holder (I think) for $2. Begin by cutting your post card in half. Then Cut off a strip of tape that is long enough to rap around the jar. 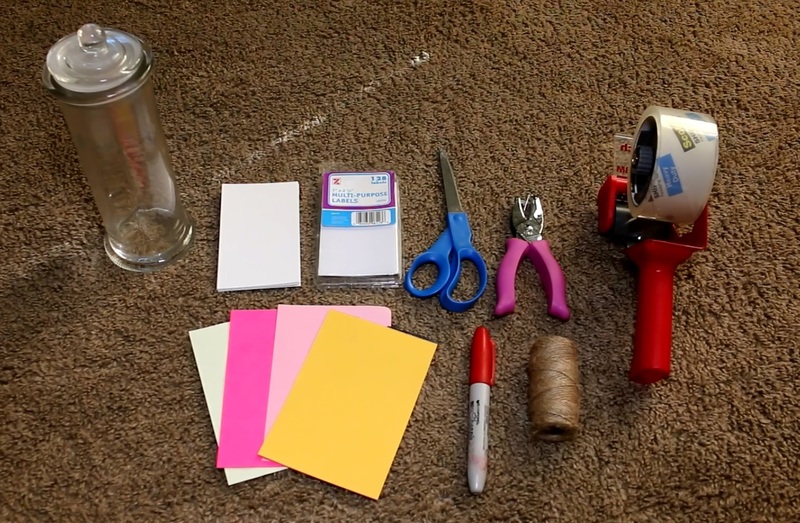 Put your note card in the center of the tape and then attach it to your jar. Now cut a long piece of twine and put one of the ends through the hole in the paper. Wrap the twine around the jar and tie off the ends. Not too tight because you might need to add more paper later on in the year. You’re done! 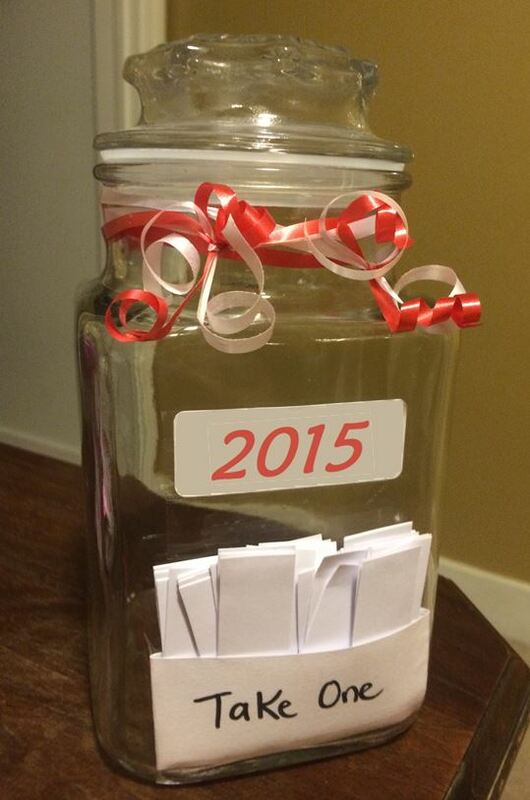 Start this jar on January 1st, then anytime you have a memorable moment you want to remember, add it to the jar. Then on December 31st, while you’re waiting for midnight…..begin to open them! Enjoy all the moments with your family while you wait for the new year! I found my jar today and will be making this tonight!! So excited to start this. I think it’s so easy to look back on a year and think it wasn’t so special. This will help remind you of all those “little” moments worth remembering.